So where are the good superheroes? The warriors for truth and justice, the defenders of the American way? The supes can't all be dirtbags... can they? Meet the true heroes of The Boys' universe, the young men and women who fight to make things right and ask nothing in return: the teenage adventurers from our far future that the world knows as SUPERDUPER! 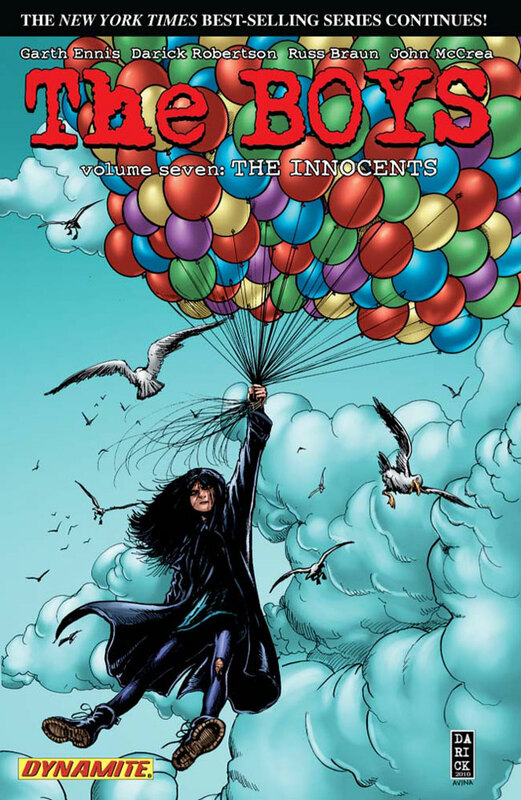 Meanwhile, convinced that Hughie was never what he seemed, Butcher goes to see the Legend... and sets somethingterrible in motion for our little Scots pal.The Innocents reprints The Boys issues #39-47, along with a complete cover gallery by artist Darick Robertson. Another great volume. I'm really loving the focus on the development of Hughie's character. We get to see more and more of his thoughts and ideas. I especially love his reactions to The Boys' plans. He definitely is the most interesting character throughout the series. I can't wait to see what happens now that he knows Annie is Starlight. This should really get interesting. Oh! And I almost forgot about The Homelander's plans. I wonder how VA and The Boys are going to react to this turn of events.